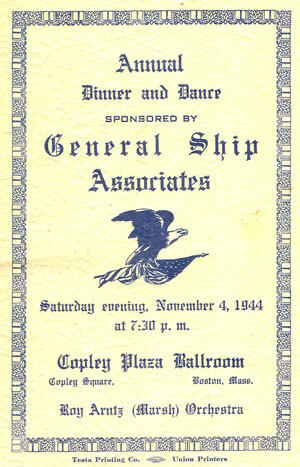 Each year Boston General Ship & Engine Works held a Dinner Dance bringing together its associates in the shipbuilding business. In the year 1944, the following companies appeared in the program for the dinner dance featuring the Roy Arntz (Marsh) Orchestra. We are providing the complete list as it is such a fascinating documentation of all the multiple facets of the shipbuilding business. Weise Engineering Equipment Co., High Street, Boston Mass. The Gibby Press, East Boston, Mass. Chemical Cleaning Process Company, 286 State St.
C.E. Hall & Sons, Inc, Trucking, 60 New Cross Street, Somerville, Mass. John R. Parry, Mill Supplies, Heavy Hardwear, 135 Pearl St, Boston, Mass. Akeson Fuel Co. Inc, 235 Salem Street, Woburn, Mass. McAuliffe & Burke Co, Plumbing and Heating Supplies, 19-29 Troy Street, Boston, Mass. Collins the Florist, 585 Broadway, Chelsea, Mass. C. A. Westhaver, Distributor of Plibrico Refractory Products, Lechmere Warehouse, Cambridge 41 Mass. Thomas E. Hogan, distributors of Fiske Tires - Willard Batteries, 87 Huntington Ave.